This is a reality check not for the developer who's code is being examined but for myself, the "DotNetNuke Module Development Evangelist". The code examined here achieves the most important requirement. It works. The challenge for the "Evangelist" is to provide suggestions that offer improvements in time and efficiency. Just saying that "this is the recommended way" is not good enough. Learning new techniques is a costly process itself. This must be factored into the total cost. No developer can be expected to do anything that is more costly than the alternative. The module being examined is called VC Links. 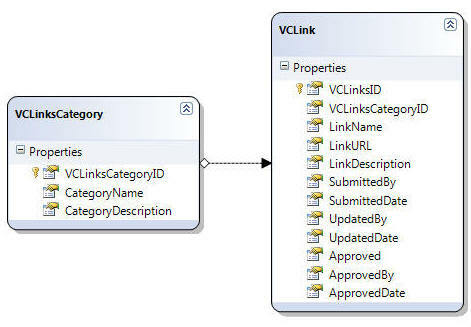 It allows an administrator to define categories and add links to each category. The entry point for the application is "VCLinks.ascx". It implements the Dynamically Loaded Control pattern. The query string for each link is examined and the appropriate user control is injected. The recommended navigation is covered here: NavigateURL: How to make a link the reasons are covered here: Module Navigation Options. While NavigateURL is the recommended approach it does not save any code. The primary objection to the Dynamically Loaded Control pattern that is can produce some odd behavior in certain situations because dynamically loaded controls do not save viewstate. There are solutions. For example, Denis Bauer has created a Dynamic Placeholder that maintains the viewstate of dynamically loaded controls. A tutorial describing it's implementation can be found at this link. Since the current code works and there is no code savings the recommendation is to leave the code as it is. The module performs the standard CRUD operations. To illustrate this the link administration will be examined and a new page that contains the same functionality will be created. Again, the stored procedure is simple and straitforward. Looking at it, there is nothing "wrong" that stands out. You could not find fault because the DotNetNuke DAL is not being used because the DotNetNuke DAL is meant to be used in situations where you need to support multiple databases. For this module that is not the case. 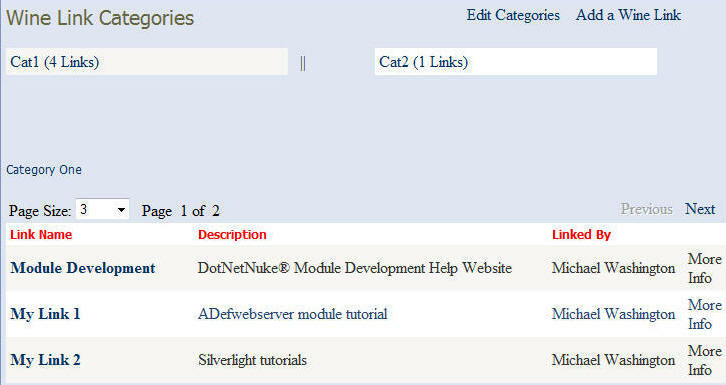 In addition the DotNetNuke DAL would require far more code. While the ExecuteSQL method of the DAL+ can be used to eliminate the need to create the stored procedures, it will not save very much work or time because essentially the same code that is in the stored procedure still needs to be created in the ExecuteSQL method. 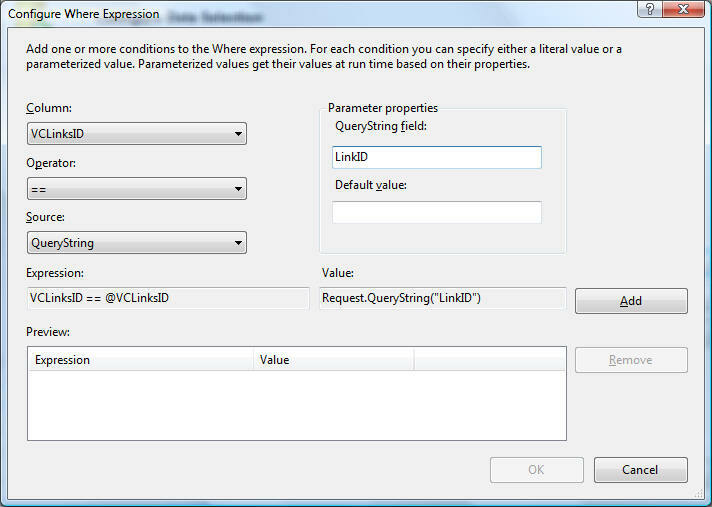 The recommendation is to use Linq to SQL to save the amount of code needed. In addition the wizards provided by Visual Studio, when you use declarative data binding to strongly typed data sources, will also save considerable time when creating the user interface. The assumption we will make is that reducing this code will reduce development time and the amount of potential coding errors that have to be debugged. The stored procedures will be eliminated also but this is a by product of implementing the solution. This tutorial provides an in-depth demonstration of using Linq to SQL: Creating a DotNetNuke Module using LINQ to SQL (VB and C#). For this module, we will simply create a Linq to SQL class and drag the two tables the module uses onto it and then save the page. The DAL is created in less than a minute. This "Linq to SQL DAL" is a class that is automatically created that contains classes that are mapped directly to the database and provide the functionality to manipulate the database and it's data. In addition the Linq to SQL class provides change tracking. The Linq Data Source control can be used to configure automatic Creates, Reads, Updates, and Deletes. 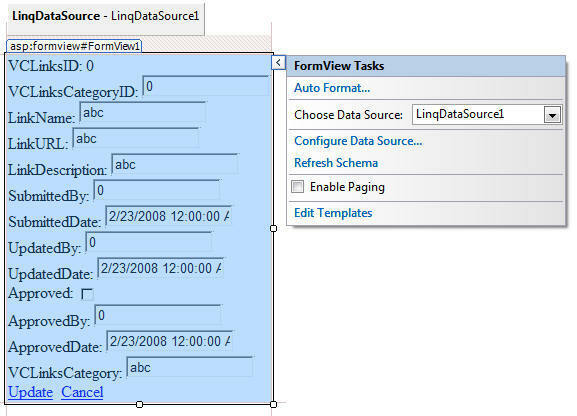 When the FormView is placed on the page and connected to the Linq Data Source control, the form is automatically created. ucAdminLinks.ascx.vb (80 lines of code). Most importantly it takes a lot less time to create. Programming is art much the same way constructing a building is art. We desire to follow standard conventions to construct safe buildings, yet there is plenty of room for interpretation. The artistic aspects of programming is one of the things that motivates many of us to program. Yet, as the discovery of perspective was revolutionary for art, technologies such as Linq are also revolutionary. However, it is up to the programmer, the artist, to determine when, where, and how to apply them.